SHELBY COUNTY -- Defense, defense and more defense as the Mountain Brook Spartans go on to defeat Oak Mountain 21-0 at Heardmont Park Thursday night. The Spartans defense kept the Eagles offense off the scoreboard for the first time this season. Mountain Brook (6-0, 4-0) grinded out a touchdown drive in the first half and again in the second half and received a muffed punt return for a short touchdown to get the big region with and clinch a playoff spot in Class 7A, Region 3. Mountain Brook still has Hoover, Thompson and Hewitt-Trussville coming up to see where all the seeding shakes out in the region. "Just a lot of resiliency as Oak Mountain made some changes this week," said Spartans head coach Chris Bell. "They made us to adjust a lot during the game. They did a heck of a job for preparing for us. We did a great job of counter punching. Our running backs ran the ball extremely well along with Gibbs. I don't remember anyone that shutout Oak Mountain. It was all about our defense. They were hungry and did a fantastic job. Anytime you have two weeks to prepare for a team with our great coaches it makes a difference." Both teams were scoreless in the first quarter but Oak Mountain was driving in the second quarter but a deflected pass was picked off by Spartan defensive back Alex Washington to stop the Eagles offense. With the defense getting the turnover, the offense turned it into points when Daniel Wilbanks scored on a 6-yard touchdown run and with 3:57 left in the half, the Spartans led 7-0. With the score, Mountain Brook took a 7-0 halftime lead and the Spartan defense played well in the first half along getting back a Spartans linebacker who sat out the last two games. "This means the world to me to get back in the game after sitting out the last two games," said Spartans linebacker Colton Yeager. "Coming back and being with my brother it was awesome. This game gives us a lot of confidence. We have great coaches and they put together a great game plan and we executed it. They have a great quarterback and we knew we had to get him early because he's had some big games this year." In the third quarter, the Spartans drove down the field and with 7:50 left in the third quarter, Aj Gates scored on a 11-yard touchdown run around the left end and Mountain Brook took a 14-0 lead. The Oak Mountain defense forced a Mountain Brook punt late in the third quarter but the punt hit an Eagle player and the Spartans recovered the fumble at the Oak Mountain 2-yard line. On the next play, Gates scored on a 2-yard touchdown run to give Mountain Brook a 21-0 lead with 3:32 left in the third quarter. Mountain Brook has outscored opponents 85-7 in the second half this season. Late in the fourth quarter, Baynes Autrey picked off an Oak Mountain pass. On the night, the Spartans defense created three turnovers. "We were sitting in Tampa and saw the ball and just made a play on it," said Spartans DB Autrey. "We prepared well this week and had a great game plan and it worked. We just have to keep playing hard each game." 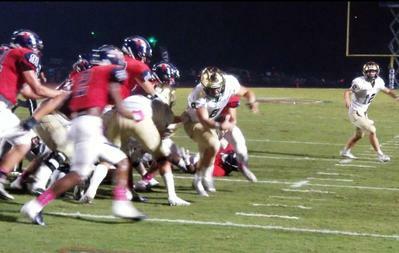 Mountain Brook held Oak Mountain to less than 150 yards on the night. The Spartans ball controll game have over 200 yards rushing and kept the ball for most of the night. Look for the same game plan to go against Hewitt-Trussville, Hoover and Thompson to keep those talented offenses off the field. The Spartans offensive line was lights out keeping the ball for most of the game. Up next, Mountain Brook travels to play Hewitt-Trussville while Oak Mountain travels to Tuscaloosa County. "Defensively our kids battled keeping them to 7-0 at halftime," said Eagles head coach Chris Bell. "We were tired on defense in the second half, we need to evaluate our offense with the second week in a row we haven't done much."